I’m writing four days after replacing a heat pump water heater (HPWH), so this isn’t based on long-term experience. When I designed my Passive House home and accessory apartment, the heat pump water heaters on the market were designed for installations in large spaces, and were too noisy for use near living areas. In my buildings without basements, I had no suitable locations. Yet one brand, AirTap, was quiet, 48 dB; ducted, so it could be used in a small space; and had a stainless steel tank. As they were about to be co-branded with Electrolux, it appeared to be a good bet. Yet by the time I was ready, they’d gone out of business. I was given a reasonable explanation—refrigerant leaks in many of the first units led them to replace all, and that exceeded their financial capability. Their distributor was selling the remaining stock at a low price and claimed the early problems had been corrected. That hasn’t proven to be true, so I’ve just replaced one of the two with a 50 gallon Rheem Performance Platinum HPWH. I immediately realized that I’d bought time with the old units; the Rheem does everything I need with features not available years ago. It is quiet at 49 dBa; and can be ducted for either intake, exhaust, or both. It doesn’t have a stainless steel tank yet has a resistor anode rod. I’ve not disassembled it to see how easy it is to access the anode rod. Installation was easier than the previous unit, and the locations of the water and electrical connections were close enough for a relatively easy changeover. The AirTap cold air discharge was on the top; on the Rheem that is the intake. My existing flex duct didn’t reach, so I added a foot of rigid duct and a reducer; the existing 6” duct is well within the specifications. By drawing intake air from the far end of a hall, a large air volume is still available yet the cold discharge is in the laundry room rather than the hallway. That brings cold discharge farther from living spaces, so it should be more satisfactory in the winter than the previous set-up. The efficiency is considerably higher, COP (coefficient of performance) 3.55. The settings on the display screen are more intuitive than the previous. If there is a chance that someone would inadvertently change settings, the control can be locked, and it can also be controlled with a smart phone. There is a wire at the bottom that you lay on the floor or in a drip pan which will alert you of a water leak. I’d noticed that stand-by losses in the previous unit seemed excessive, yet as I’ve never had a tank with a digital temperature read-out I couldn’t be sure. It made me opt for a small HPWH, 50 gallons versus the previous 66, though the Rheem is available in larger sizes. Stand-by losses seem to be a bigger issue for me than running out of hot water. The new unit doesn’t appear to drop temperature quickly. On the AirTap, one could change the temperature differential for when the heat pump would turn on. Efficiency increases at higher differentials. Yet I found even a slight difference in shower temperature objectionable, so I set the differential to 10 degrees F, less than recommended. According to Rheem technical support the differential is 20 degrees F yet I’ve not noticed it. With only days of experience, I’m pleased with this unit. Four people have been using hot water during this initial use. By the way, my local utility’s rebate for a 50 gallon HPWH is greater than for 55 gallons or larger. What are other options? The Stiebel Eltron is more expensive, yet includes a stainless steel tank and an electric anode rod. That means the anode never needs to be replaced, so despite a considerably higher initial cost it may be less expensive in the long run. An electric anode may reduce or eliminate the smell of sulphur from well water. That is an issue here; I’ve not noticed any sulphur smell with the Rheem yet it is intermittent. Different metals used for anode rods can also affect the smell. After-market electric anodes can be purchased to replace standard anodes and are reported to reduce or eliminate sulphur smell. I may try one in the future. Another option which I’d consider for a new build is Sanden, a split system with the compressor outside so indoor noise is eliminated. It uses CO2 as the refrigerant, an excellent move towards reducing climate change. Its COP, 5, is quite high. Another potential direction I usually don’t consider is solar hot water, as I prefer to use photovoltaic panels to provide electricity to power the HPWH or any other need. 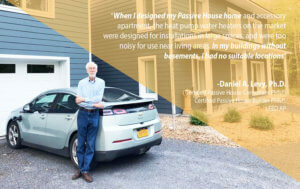 Yet I recently toured netZero Village, an apartment complex in Rotterdam, NY. Since they can get a COP of 40 with solar water panels when the sun is shining, they consider it well worth the cost of panels and large storage tanks. Since they are providing hot water to multiple apartments, that may skew the decision compared to a single residence; a topic for another conversation.